Over time, roofs in Palo Alto, CA become susceptible to the effects of weathering, such as sun and wind damage. To help combat these effects, Enrico Thomas offers a few tips in the Yahoo Contributor Network, on how to spot problems such as corroded gutters and buckled flashings. Look for loose or missing shingles, mold and decay, loss of granulation, and curling. Remember that a loose shingle doesn’t directly mean it’s a bad one, there are more signs you need to find first. 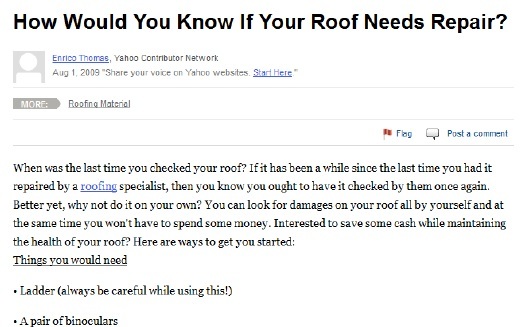 You also need to inspect the roof for any signs of unevenness or sag. Indicators of a weak framing are cupping and buckling, so pay extra attention on these. Check the gutters for rust and clogs. Flashings. These are metal pieces that can be found on waterproof spots of the roof. Try to look for puckering or buckling in the material, looseness and tears. Make sure to inspect your chimney as flashings on them are more prone to damage. Safety should remain a priority even when homeowners suspect trouble in their roofs. If homeowners feel they can’t safely carry out a roofing inspection on their own because of lack of proper equipment, they should consider enlisting the services of trusted roofing contractors in Palo Alto, CA instead. These professionals are not only equipped with the proper safety gear and the right training to do the job; they also carry workman’s compensation insurance to protect homeowners from liability should an unfortunate incident occur on the latter’s property. Professional roofing inspections and roof repairs in Palo Alto can involve considerable costs, and homeowners looking to get their hard-earned money’s worth on roofing services may wish to consider hiring the services of a family-owned roofing company. According to the Houston Chronicle, employees of a family-run business are typically very dedicated and motivated, as they have a stake in the success of the business. Furthermore, compared to bigger businesses, family-owned companies are more open to customizing their services according to a customer’s situation. 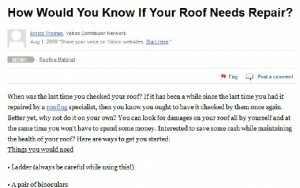 Many Palo Alto homeowners may not know if their roof needs repair work until a proper roofing inspection is done. These homeowners can turn to professional roofers to determine what their roof truly requires. To receive quality customized roofing services, locals can turn to family-owned roofing companies like Shelton Roofing, who are committed to make a difference in their customer’s lives.